Creating a positive ‘identity’ for refugees? In most media discourses, Refugees are constructed as pathological creatures. The entire discourse of refugees and their plight is portrayed as something of a ‘problem to be fixed.’ While it is true that most refugees are in need of desperate help and do, over a short period of time, burden the economy of any host country; but research has shown – and common sense should tell us – that over a long period of time, refugees are a boon to any place where they go. 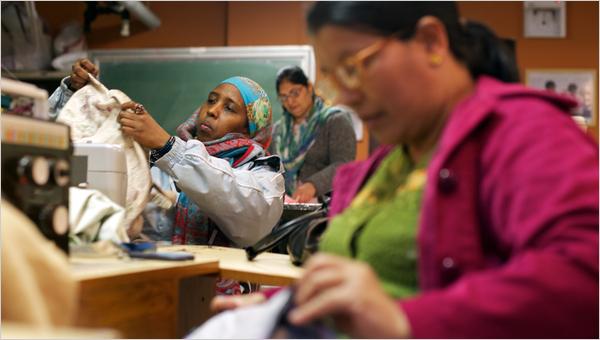 As this OpEd in NY Times points out, refugees contribute to the revitalization of economies. As a former resident of upstate NY, I saw the impact of this phenomenon. Most of the refugees settled there are independent, self-sufficient and actually quite wealthy, all in a matter of less than 20 years. That is just one generation. Bosnians fleeing the Balkan war are among the refugees who live in this region and are among the prosperous communities there. Similarly, when media accounts of refugees portray them as helpless victims, who are in perpetual need of assistance, the reality is quite different. As they are fleeing persecution, they are also deeply conscious of the need to re-build their lives and are eager to take up any opportunity that comes their way. As the NYT OpEd mentioned earlier points out “A 2003 survey by the University of Michigan of 1,016 members of this community (58 percent of whom were Christian, and 42 percent Muslim) found that 19 percent were entrepreneurs and that the median household income was $50,000 to $75,000 per year.” This goes against our popular understandings of what refugees do, and how ‘dependent’ they are on welfare. This bias is not only present in media discourses, but also scholarly literature on Arab-Americans in general and refugees in particular. I came across this phenomenon, as I was researching the issue for a policy brief, that I am writing, as part of my work at ACCESS. Why is this cognitive bias present? Is it because the dominant framing of refugees is set? It is set – in terms of framing them as helpless, without agency and will power? – as essentially victims who are not capable of shaping their destiny? While this is part of the story, it is not the entire story. True, they are helpless ( for the time-being) but are not without agency or will power. The Syrian refugees, for instance, are taking enormous risks, putting their lives in danger, to move to a safer area, to live and prosper. This shows not only their resilience and determination to fight against all odds, but also their imagination and ability to think outside of the box. America should embrace this positive energy and will to live. It is what has made the U.S . a great country and it is what drives innovation and change. It is time we all re-examine the dominant narratives of the refugees as a burden and look at them for what they are – victims of circumstances, who will thrive, in the right environment. It is our duty, as decent human beings to help them find this environment. Author Sabith KhanPosted on September 30, 2015 September 30, 2015 Categories ACCESS, Arab Philnathropy, RefugeesTags Alexis De Tocqueville, Charity, Refugees, USALeave a comment on Creating a positive ‘identity’ for refugees?